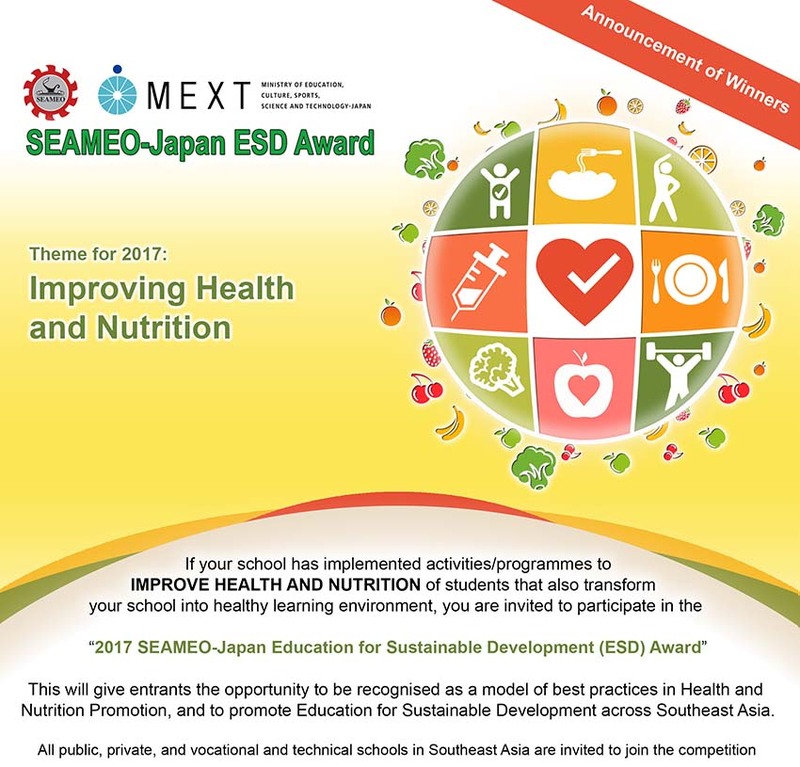 The Southeast Asian Ministers of Education Organization (SEAMEO) and the Ministry of Education, Culture, Sports, Science and Technology (MEXT), Japan in cooperation with UNESCO Asia Pacific Regional Bureau for Education would like to congratulate all awardees and express appreciation to schools who participated in the 2018 SEAMEO-Japan Education for Sustainable Development (ESD) Award under the theme of ‘Applying Local Wisdom for Environmental Conservation’. "PLANTATION: Participative-Active Learning through the Adoption of “Tritangtu” Philosophy to Save the Environment!" School Principal: Mr Dadan Erawan, S.Pd., M.Pd. Coordinating Teacher: Mr Ginanjar M Sukamdani, S.Pd. All schools which were shortlisted will receive a Certificate from the SEAMEO Secretariat. The following lists are 94 entries from schools in 7 Southeast Asian countries, namely, Brunei Darussalam, Indonesia, Cambodia, Malaysia, Myanmar, Philippines, and Thailand. We also receive 1 entry from India. 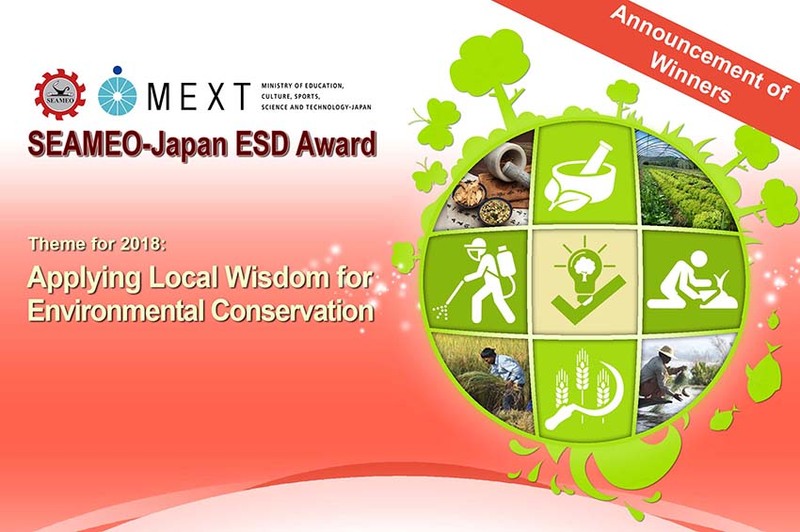 The Judging Committee would like to express appreciation for their participation in this 2018 SEAMEO-Japan ESD Award under the theme of “Applying Local Wisdom for Environmental Conservation”. Note: All participating schools will receive the Certificate of Participation from the Award. In 2002, the United Nations General Assembly adopted Resolution 57/254 and declared the period 2005-2014 as the “United Nations Decade of Education for Sustainable Development” (DESD). At the end of the DESD in 2014, the UNESCO World Conference held in Japan announced the Global Action Programme (GAP) on ESD aimed at generating and scaling up ESD actions at all levels and in all areas of education, training and learning to accelerate progress towards sustainable development to the post-2015 agenda. While ESD is implemented worldwide under the GAP, in support of further promoting ESD in Southeast Asia, the Southeast Asian Ministers of Education Organization (SEAMEO), and the Ministry of Education, Culture, Sports, Science and Technology, Japan (MEXT), in cooperation with the UNESCO Asia and Pacific Regional Bureau for Education, have shown their collective commitment to promoting best practices in ESD in schools across Southeast Asia by organising the SEAMEO-Japan Education for Sustainable Development (ESD) Award. The award scheme has been held annually since 2012. In 2015, the United Nations General Assembly adopted 70/1 Resolution which determined the Sustainable Development Goals (SDGs).Two years after the resolution, the United Nations General Assembly reaffirmed that ESD was an integral element of SDGs on quality education and a key enabler of all the other Goals (SDGs) in its Resolution 72/222. Against that background, significance of ESD Award will be recast in light of its contribution to achieving the SDGs. To encourage networking among schools and communities which implement ESD practices in Southeast Asian countries and Japan. To support the Sustainable Development Goals (SDG) of United Nations. 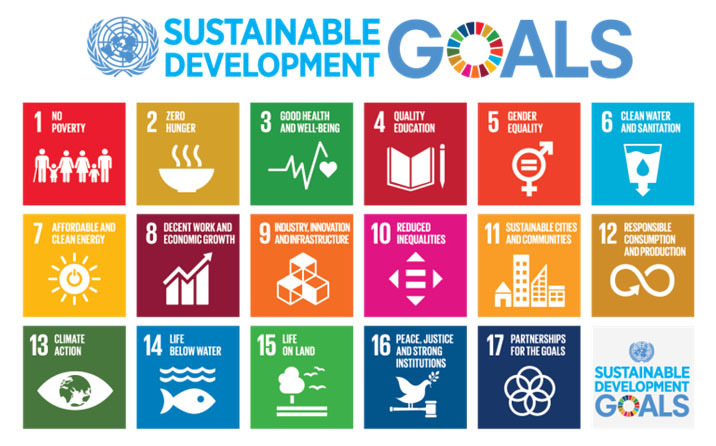 *The Sustainable Development Goals (SDGs) consist of 17 integrated and interdependent global goals with associated 169 targets, which aim to shift the world on to a path towards sustainable and resilient development. The first awards scheme in 2012 was conducted under the theme of: "Education for Disaster Risk Reduction". This initial competition attracted entries from 69 schools in Indonesia, Lao PDR, Malaysia, Myanmar, Philippines, Thailand and Vietnam. The award in 2013 was conducted under the theme of "Values Education"and attracted entries from 126 schools in eight Southeast Asian countries, namely, Brunei Darussalam, Indonesia, Lao PDR, Malaysia, Myanmar, Philippines, Thailand and Vietnam. The award in 2014, under the theme of "Fostering Global Citizenship for Sustainable Future", involved 63 schools in nine Southeast Asian countries, namely Brunei Darussalam, Indonesia, Lao PDR, Malaysia, Myanmar, Philippines, Singapore, Thailand and Vietnam. The award in 2015, under the theme of "Safeguarding our Cultural Traditions", participated by 90 schools in ten Southeast Asian countries, namely Brunei Darussalam, Cambodia, Indonesia, Lao PDR, Malaysia, Myanmar, Philippines, Singapore, Thailand, and Vietnam. The award in 2016 was conducted under the theme of "Saving Energy",involved 43 entries in eight Southeast Asian countries, namely, Brunei Darussalam, Indonesia, Lao PDR, Malaysia, Myanmar, Philippines, Singapore, and Thailand. The award in 2017 was under the theme of "Improving Health and Nutrition". The award has successfully attracted 56 entries from eight different Southeast Asian countries: Brunei Darussalam, Indonesia, Malaysia, Myanmar, Philippines, Singapore, Thailand, and Vietnam. II. Theme for 2018: “Applying Local Wisdom for Environmental Conservation"
Southeast Asia is not only blessed with natural resources but also with abundant cultural diversity and pluralistic society across the region. Each community has social resources that are beneficial to development such as traditional knowledge, wisdom, and environmental ethics1. Over the past several decades, the problem of environmental sustainability has stemmed from humans destroying natural resources. Natural destruction also includes soil erosion, wild fires, forest fires and so forth2. To live with harmony with the environment, local people used the local wisdom accumulated by their ancestors to manage natural resources. The utilization of local wisdom can be seen in terms of their daily activities such as work and festivals3. 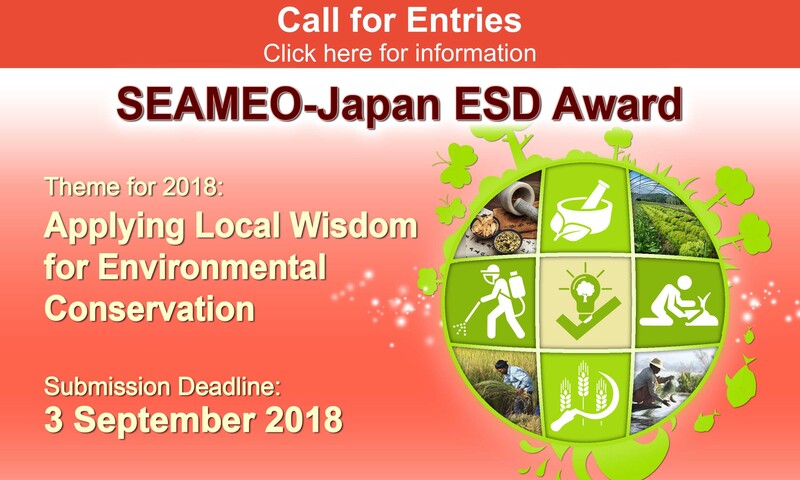 Considering the important roles of local wisdom for harmonising the implementation of environmental conservation, the 2018 SEAMEO-Japan ESD Award selects the theme “Applying Local Wisdom for Environmental Conservation”. “Local Wisdom” refers to the accumulated experiences that are used in daily life and are transmitted from generation to generation. Local symbol of culture: myths, ritual, arts, and knowledge and practices concerning local nature and global environment that can be applied for environmental conservation. 1Sampurasun e-Journal, Vol 10, No 01, Astri Hasbiah, Analysis of Local Wisdom as an Environmental Conservation Strategy in Indonesia, Dec 2015. 4Meliono, I., 2011, Understanding the Nusantara Thought and local wisdom as an aspect of the Indonesian education. 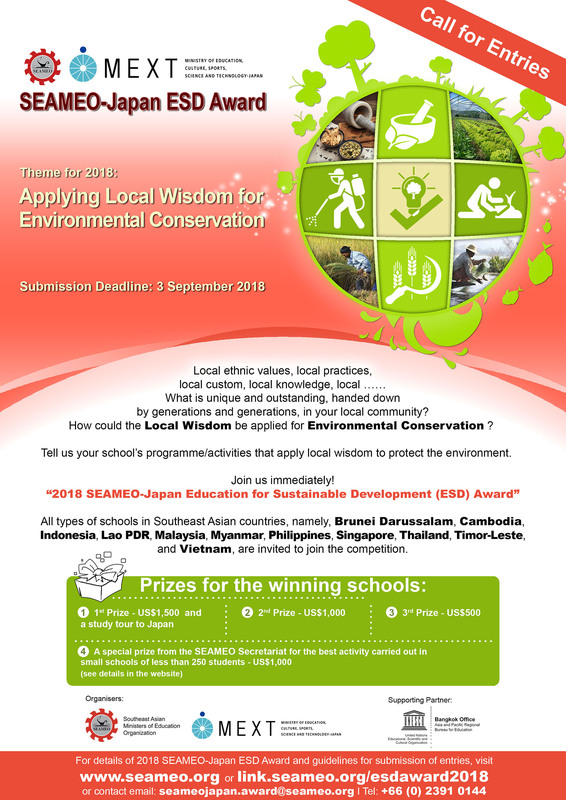 To raise awareness of local wisdom applied for environmental conservation and sustainable development in schools and communities in Southeast Asia and Japan. To promote and share initiatives and good practices that support sustainable development through the integration of local wisdom into the teaching and learning practices and school programmes that protects local environment and develops local community. All public and private kindergarten/elementary/secondary/vocational and technical schools in 11 Southeast Asian countries – namely Brunei Darussalam, Cambodia, Indonesia, Lao PDR, Malaysia, Myanmar, Philippines, Singapore, Thailand, Timor-Leste and Vietnam – are invited to submit information about programmes, projects and activities that are related to the theme of this year’s competition. (The organizer will sponsor the travel expenses for four to six persons, which includes round-trip airfares, accommodation for three (3) nights, domestic transportation in Japan, interpreter, and visa fees). All winning schools will receive a Plaque of Recognition and Certificate of Appreciation for teachers and students involved in planning and implementing the school’s programme. A representative of the winning schools will be sponsored to participate at the award presentation ceremony which will be held at the SEAMEO High Officials Meeting in Bangkok in November 2018. All shortlisted schools will receive Certificate of Recognition for the school. The coordinators of shortlisted schools (Maximum of 2 persons) will receive the Certificate of Appreciation. All participating schools that have submitted entries relevant to the theme will be recognised (name, project name and country) on the SEAMEO website and receive the Certificate of Participation. Promotion of local wisdom for environmental conservation is emphasized and incorporated into school policies, management plans, and teaching and learning programmes within the school. The school has ensured the continuous evolution of local wisdom from one generation to the next, so as to help keep a practice alive and relevant to the communities or groups who practice it. The school has demonstrated clear effective strategies, steps, and activities in applying local wisdom for environmental conservation/protection. The school has demonstrated the use of participatory processes – involving students, teachers, parents, communities’ stakeholders and partners – in planning and implementing the programmes. Appropriate and effective methods and resources are used to implement the programmes. Monitoring and evaluation mechanisms or processes are identified to ensure the immediate and long-term outcomes of the programmes. The school’s programme has demonstrated innovative practices in promoting local wisdom for environmental conservation. The school’s programme has demonstrated innovative practices in integrating local wisdom and current education system. The school has demonstrated innovative ideas for utilising available resources. The entry is a new idea or an improved/adapted version of existing activities. The school has demonstrated effective teaching and learning approaches that have been applied to the preservation and promoting of local wisdom for environmental conservation. The school has embedded knowledge about local wisdom into subject disciplines and incorporated ESD principles and pedagogical methods to ensure that students are able to connect the practices in their community, in their local environment, materials and resources, and learn more effectively. The teaching and learning approaches has demonstrated the change or transformation of attitude, habits, behavior of students and teachers by applying local wisdom for environmental conservation. The school has engaged community-level partners such as community stakeholders, experts, cultural bearers, elders, local leaders, practitioners and parents who provide information and guidance on local wisdom. The school has engaged multi-sector partners such as education institutions, teacher-training institutions, schools, cultural institutions and professional associations to co-implement the school’s programme. The school’s programme has strengthened students’ involvement in the local community, especially for environment protection, human resource development, sustainable development, and etc. Through the school’s programme, the school has engaged and contributed to the development of local community, not just only parents. The school has promoted local wisdom practices within the school management plan and teaching and learning activities across subjects for a long-term action strategy. The school has demonstrated a clear future plan on how to sustain the programme. The school has demonstrated that the school’s programme has integrated the improvement of other SDGs, not the individual pursuit of each SDG, but has interrelation with other SDGs. – Therefore, the school should make a clear statement in its application on how the school’s programme connects with other SDGs apart from SDGs 14 (Life below Water) and 15 (Life on Land). Results, during/after implementation, have revealed the effectiveness and benefits of the school’s programme to students, teachers, parents and the wider communities. Information, data, and model collection about local wisdom has been effectively compiled, documented, and shared within the schools, among schools in one community, and at the broader provincial or national levels. The Judging Committee consists of experts in the areas of education, education for sustainable development, and cultural development from Japan and the Southeast Asian region. The decision of the Judging Committee is final and challenges/appeals are not allowed. Schools can submit information about the school’s programme/project/activity related to the theme “Applying Local Wisdom for Environmental Conservation” from 10 June to 3 September 2018. Each school can submit only one entry. 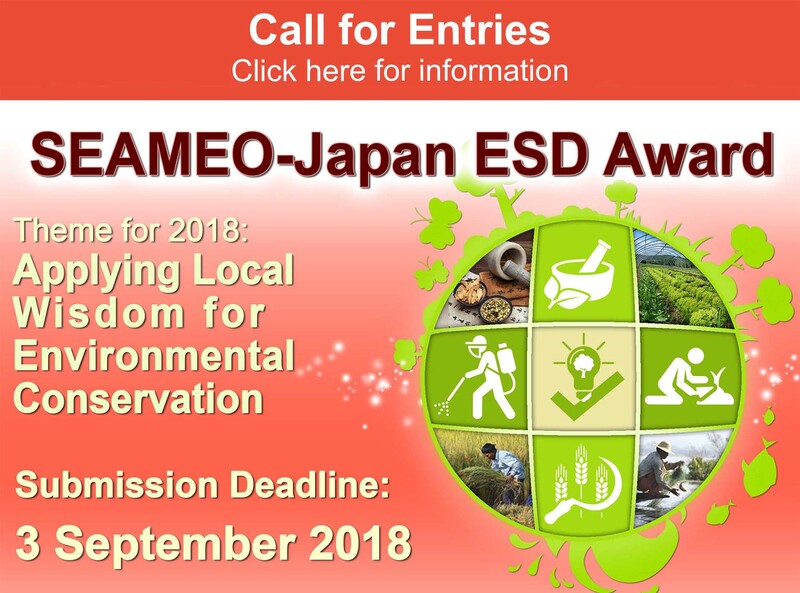 The submission of the school’s programme must be done through the template “Submission Form of 2018 SEAMEO-Japan ESD Award”. The Submission Form can be requested by sending an email to the email address: seameojapan.award@seameo.org. List of attachments such as a copy of the school operational plan, action plan, learning/teaching materials, lesson plans, samples of student worksheet, manuals, etc. Information about the programme and the photo captions must be in English. The teaching and learning materials can be in local languages, however a brief translation in English should be provided. All entries submitted to the SEAMEO Secretariat will be acknowledged. If the school has not received any acknowledgement of the receipt from the SEAMEO Secretariat within one week after the submission, please contact the SEAMEO Secretariat (Email: seameojapan.award@seameo.org). 3 September 2018 Period for submission of entries to the SEAMEO Secretariat by schools. Monday 3 September 2018 The last day for submission of entries. 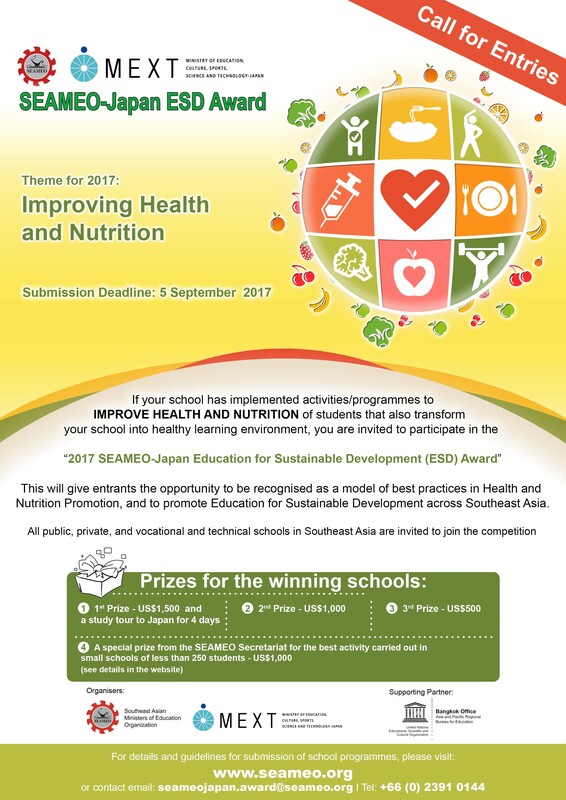 The Southeast Asian Ministers of Education Organization (SEAMEO) and the Ministry of Education, Culture, Sports, Science and Technology (MEXT), Japan in cooperation with UNESCO Asia Pacific Regional Bureau for Education would like to congratulate all awardees and express appreciation to schools who participated in the 2017 SEAMEO-Japan Education for Sustainable Development (ESD) Award under the theme of ‘Improving Health and Nutrition’. Note: The decision of the Judging Committee is based on the information provided in the submission form and supporting documents from the schools. The following lists are 56 entries from schools in 8 Southeast Asian countries, namely, Brunei Darussalam, Indonesia, Lao PDR, Malaysia, Myanmar, Philippines, Singapore, and Thailand. 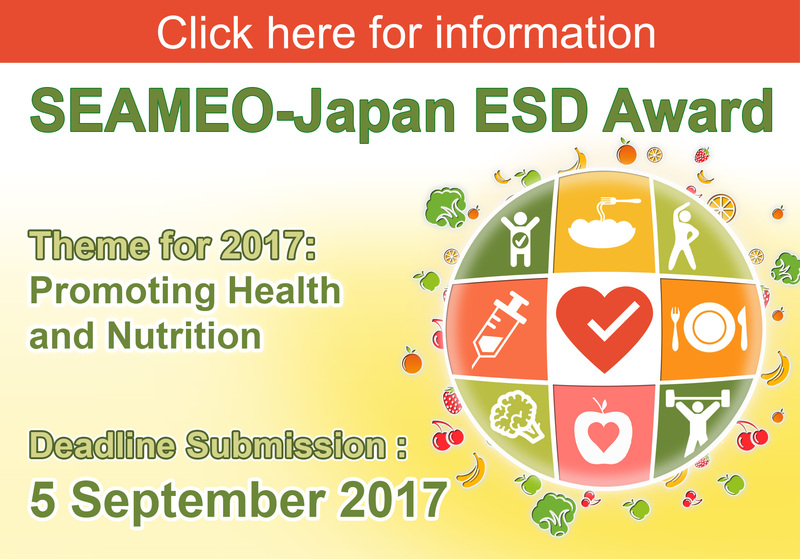 The organisers and the Judging Committee would like to express appreciation for their participation in this 2017 SEAMEO-Japan ESD Award under the theme of “Improving Health and Nutrition”. Large numbers of school children in Southeast Asia suffer from ailments such as diarrhea, acute respiratory diseases, worms and dental caries, all of which are preventable and caused mainly by poor hygiene. These illnesses seriously impair a student’s physical and cognitive development and have a negative impact on their ability to learn and their prospects *. To promote Education for Sustainable Development in schooling system, “Health and Nutrition” is one of the most important issues and concerns of policy makers and educational leaders in Southeast Asian countries. “Improving Health and Nutrition” can refer to any action or programme that transform schools into healthy learning environments where routine hygiene practices turn into long-term habits. This also includes the school programmes/activities to prevent local diseases and improve health condition, lunch pogramme, water and sanitation, and overall nutrition of students, as well as increase nutrition awareness and health preventive education of parents and community. To raise awareness of “Health Promotion and Nutrition programme integrated in education for the promotion of sustainable development in schools and communities in Southeast Asia and Japan. To promote and share initiatives and good practices that support sustainable development through the improvement of health and nutrition into school plan, teaching and learning practices, and daily routines of students. To encourage schools to develop and improve current ESD practices in school activities and programmes. The entry should be relevant to the theme and the scope of “Improving Health and Nutrition” as defined above. The entry should demonstrate how the school’s programme can improve health and nutrition conditions of students; transform the school into the healthy learning environments; and promote sustainable healthy habits of students, parents and community. The entry should clearly demonstrate the integration of “Improving Health and Nutrition” practices in the entire school’s policy, management plan, participatory planning and implementation, curriculum, teaching and learning practices, daily routines of students, student activities, partnership efforts, parent and community participation, and so on. All public and private kindergarten / elementary / secondary / vocational and technical schools in 11 Southeast Asian countries – namely Brunei Darussalam, Cambodia, Indonesia, Lao PDR, Malaysia, Myanmar, Philippines, Singapore, Thailand, Timor-Leste and Vietnam – are invited to submit information about programmes, projects and activities that are related to the theme of this year’s competition. (The organiser will sponsor the travel expenses for four to six persons, which includes round-trip airfares, accommodation for three nights, domestic transportation in Japan, interpreter, and visa fees). All winning schools will receive a plaque of recognition and a certificate for teachers and students involved in planning and implementing the school’s programme. A representative of the winning schools will be sponsored to participate at the award presentation ceremony which will be held at the SEAMEO High Officials Meeting in Bangkok in November 2017. All participating schools that have submitted entries relevant to the theme will be recognised (name, project name and country) on the SEAMEO website and the winning schools’ details will also be posted on the SEAMEO website. Health promotion and nutrition programme is emphasized and incorporated into school policies, management plans, and teaching and learning programmes within the school. The school has demonstrated the use of participatory processes – involving students, teachers, parents, community stakeholders and partners – in planning and implementing the programme. Appropriate and effective methods and resources are used to implement the programme. Monitoring and evaluation mechanisms or processes are systematically identified to the immediate and long-term outcomes of the programme. The school has demonstrated that the entire school joins together in improving health and nutrition condition of students. The school’s programme has demonstrated innovative and simple practices in “Improving Health and Nutrition”. The school has demonstrated innovative ideas for utilizing available resources. The school has demonstrated effective teaching and learning approaches that have develop awareness of students and community in promoting health and nutrition. The school has embedded knowledge about health and nutrition and other related environmental aspects into subject disciplines and incorporated ESD principles and pedagogical methods to ensure that students are able to connect the practices into their daily life and family. The school has engaged community partners such as neighbouring educational institutions, local government authorities and parent associations to co-implement the school’s programme. The school’s programme has encouraged public awareness and action for promoting health and nutrition for the community. The school’s programme has strengthened student involvement and a contribution to improve the sustainable development of the local community. The school has integrated the promotion of health and nutrition within the school management plan and teaching and learning activities across subjects for a long-term action strategy. Results, both during and after implementation, have revealed the effectiveness and benefits of the school’s programme to students, teachers, parents and the wider community. The school has clearly demonstrated that health and nutrition conditions of students have been improved after the implementation. The Judging Committee consists of experts in the areas of education, education for sustainable development, and health and nutrition from Japan and the Southeast Asian region. The decision of the Judging Committee is final and challenges/appeals are not allowed. The school programme must have been continued at least one year. 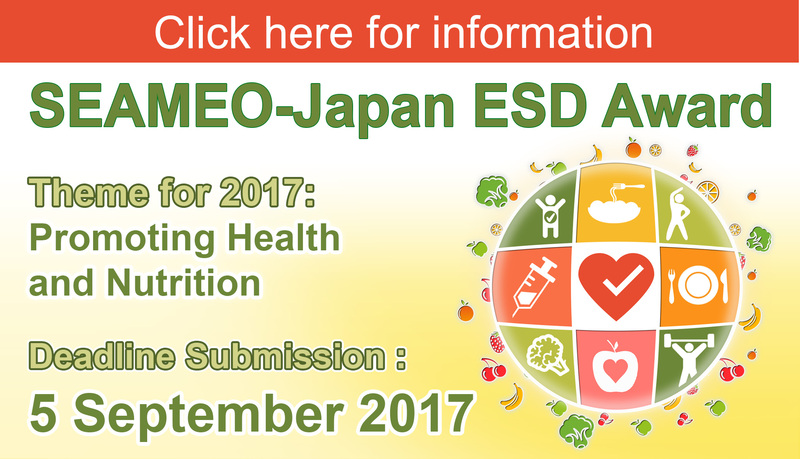 The submission of the school’s programme must be done through the template “Submission Form of 2017 SEAMEO-Japan ESD Award”. If you have difficulty to download the file, please request the form by sending email to: seameojapan.award(at)seameo.org. School name and contact details. Brief information about the school such as number of teachers and students and the educational level. Contact details of the coordinator. Title of the school’s programme. Summary of the programme (one half-page of A4 sheet size). Background information or reasons why the school created the programme. Period of time when the programme was/has been started. Activities (Actions and strategies of implementation). Teaching and learning approaches that the teachers apply for teaching “Improving Health and Nutrition”. Participation with the community and sharing of school practices to the community. Programme monitoring and evaluation mechanisms. Achievement from the school’s health and nutrition programme. Benefits/impacts/positive outcomes of the programme to students, school and the wider community. Plan for sustainability and plan for the future. List of attachments such as a copy of the related school plan, committee structure, learning/teaching materials, lesson plans, samples of student worksheet, manuals, etc. Photographs related to the school programme (maximum of five photographs with captions written in English). All entries submitted to the SEAMEO Secretariat will be acknowledged. If the school has not received any acknowledgement of the receipt from the SEAMEO Secretariat within one week after the submission, please contact the SEAMEO Secretariat (Email: seameojapan.award(at)seameo.org). 5 September 2017 Period for submission of entries to the SEAMEO Secretariat by schools. Tuesday 5 September 2017 (By midnight) The last day for submission of entries. 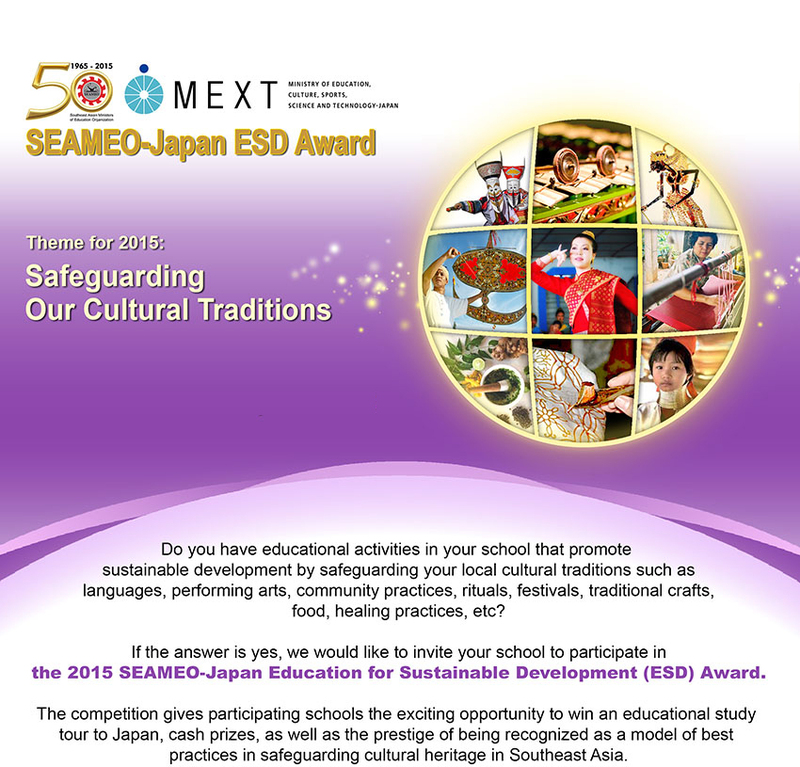 The Southeast Asian Ministers of Education Organization (SEAMEO) and the Ministry of Education, Culture, Sports, Science and Technology (MEXT), Japan in cooperation with UNESCO Asia Pacific Regional Bureau for Education would like to congratulate all awardees and express appreciation to schools who participated in the 2016 SEAMEO-Japan Education for Sustainable Development (ESD) Award under the theme of 'Saving Energy’. "Save the Energy, Save Our Present, Save Our Future"
The following lists are 44 entries from schools in 8 Southeast Asian countries, namely, Brunei Darussalam, Indonesia, Lao PDR, Malaysia, Myanmar, Philippines, Singapore, and Thailand. We also received another 2 entries from India. 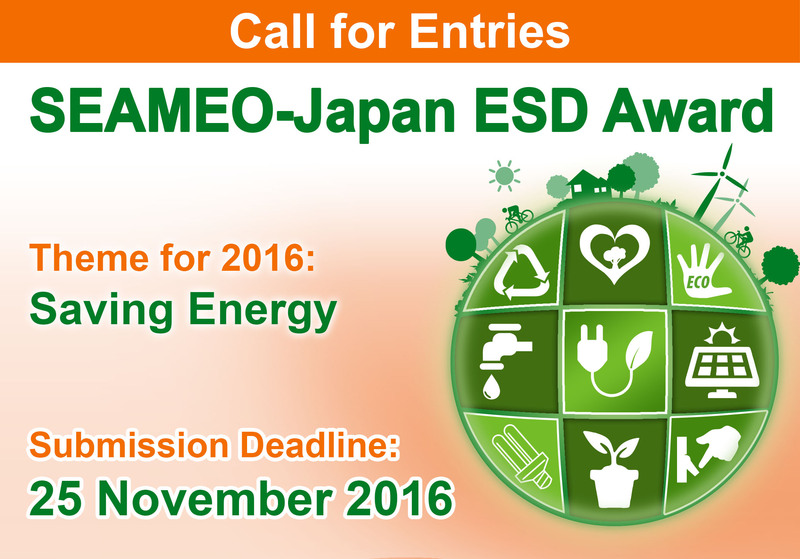 The organisers and the Judging Committee would like to express appreciation for their participation in this 2016 SEAMEO-Japan ESD Award under the theme of “Saving Energy”. The award in 2013 was conducted under the theme of "Values Education" and attracted entries from 126 schools in eight Southeast Asian countries, namely, Brunei Darussalam, Indonesia, Lao PDR, Malaysia, Myanmar, Philippines, Thailand and Vietnam. The award in 2015 under th e theme of "Safeguarding our Cultural Traditions", participated by 90 schools in 10 Southeast Asian countries, namely Brunei Darussalam, Cambodia, Indonesia, Lao PDR, Malaysia, Myanmar, Philippines, Singapore, Thailand and Vietnam. To promote ESD, energy conservation programmes have been initiated in many schools to make them more environmentally friendly and carbon-conscious (an increased awareness about carbon dioxide emissions from daily activities.) Most importantly, these programmes have given students a greater understanding of the implications of their behaviour and it has enabled them to transfer the new-found knowledge and more environmentally-friendly activities to their personnel lives. In addition, students gain leadership skills and a valuable sense of efficacy as they make significant contributions in shifting the school culture toward a higher level of sustainability1. 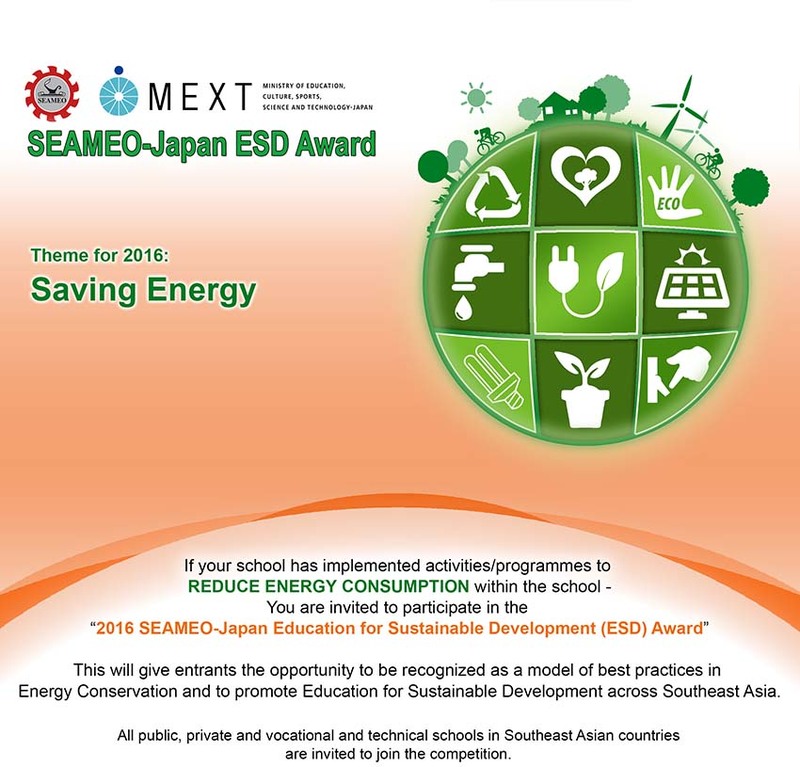 To instill wise energy habits in students and teach them to care about the impact of their actions on the environment, the SEAMEO-Japan ESD Award has selected "Saving Energy" as the theme for the 2016 competition. “Saving Energy” can refer to any action or behavior that results in using less energy. There are many actions a school can take to save energy on a daily basis. Saving energy does not simply have to involve heating, cooling and lighting, it also encompass many actions which can have a broader effect on the environment such as the reduction of energy consumption, renewal of energy, utilization of waste and so on. To raise awareness of energy conservation integrated in education for the promotion of sustainable development in schools and communities in Southeast Asia and Japan. To promote and share initiatives and good practices that support sustainable development through the implementation of energy conservation into teaching and learning practices and school programmes. The entry should be relevant to the theme and the scope of “Saving Energy” as defined above. The entry should demonstrate how the school’s programme can reduce energy consumption at the school site and greater responsibility among teachers, students, parents and communities. The entry should also identify how the school’s energy saving programme can contribute to creating a more sustainable environment and society. The entry should clearly demonstrate the integration of “Saving Energy” practices in the school’s policy, management plan, curriculum, teaching and learning practices, co-curricular activities, partnership efforts, community participation and so on. The entry should demonstrate initiatives in the sharing of successful programmes/practices to other schools or communities so that public consciousness can be raised and energy saving efforts and initiatives will be replicated in other schools and in the daily life of communities. (The organizer will sponsor the travel expenses for four to six persons, which includes round-trip airfares, accommodation for three nights, domestic transportation in Japan, interpreter, and visa fees). A representative of the winning schools will be sponsored to participate at the award presentation ceremony which will be held at the SEAMEO Council Conference in Indonesia in 2017. Saving energy/energy conservation is emphasized and incorporated into school policies, management plans, and teaching and learning programmes within the school. The school has demonstrated that the entire school joins together in energy conservation efforts. The school’s programme has demonstrated innovative practices in “Saving Energy”. The school has demonstrated effective teaching and learning approaches that have been applied to the Saving Energy programme. The school has embedded knowledge about energy conservation and other related environmental aspects into subject disciplines and incorporated ESD principles and pedagogical methods to ensure that students are able to connect the practices into their daily life, the local environment and community. The school’s programme has encouraged public awareness and action for reducing energy consumption and using a more energy efficient approach in daily activities. The school has integrated energy saving practices within the school management plan and teaching and learning activities across subjects for a long-term action strategy. The school has clearly demonstrated that energy consumption at the school has been reduced. 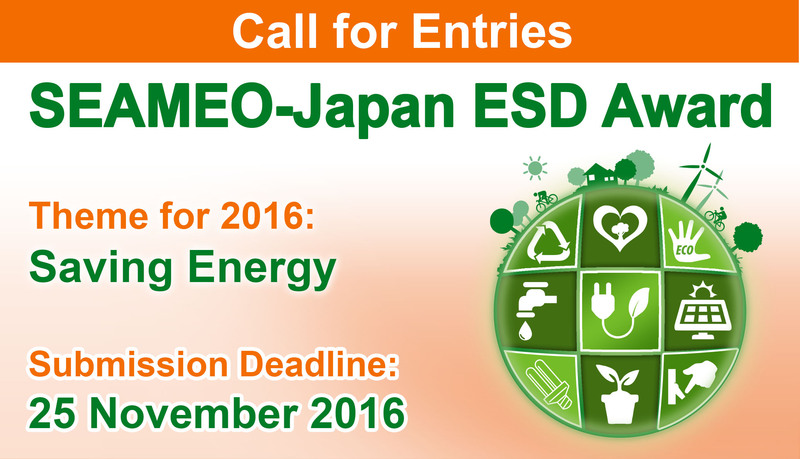 The submission of the school’s programme must be done through the template “Submission Form of 2016 SEAMEO-Japan ESD Award”. Teaching and learning approaches that the teacher applies for teaching “Saving Energy”. Achievement from the saving energy effort. List of attachments such as a copy of the school saving energy plan, committee structure, learning/teaching materials, lesson plans, samples of student worksheet, manuals, etc. 25 November 2016 Period for submission of entries to the SEAMEO Secretariat by schools. Friday 25 November 2016 The last day for submission of entries. The Southeast Asian Ministers of Education Organization (SEAMEO) and the Ministry of Education, Culture, Sports, Science and Technology (MEXT), Japan in cooperation with UNESCO Asia Pacific Regional Bureau for Education would like to congratulate all awardees and express appreciation to schools who participated in the 2015 SEAMEO-Japan Education for Sustainable Development (ESD) Award under the theme of 'Safeguarding Our Cultural Traditions’. Appreciation is also extended to the Ministries of Education of Southeast Asian countries, SEAMEO Regional Centres and Educational Development Agencies who contributed and supported this 2015 SEAMEO-Japan ESD Award. "Warna-Warna Warisan Budaya (Colourful Cultural Tradition)"
Address: Jalan Gambut, 25000 Kuantan, Pahang. "Employment orientation, Vocational Training and Job Creation for the Students who are Visually Impaired"
Address: 21 Lac Trung Street, Hai Ba Trung District, Hanoi, Vietnam. "Preserving Our Culture, Safeguarding Our Future Programme"
"Cultural and Artistic Development Programme for Blind or Deaf Children in Kampong Cham"
"Revitalizing Diverse Cultures: Towards the Attainment of Access, Retention, Completion and Achievement (ARCA) of the Indigenous People Learners"
Note: The shortlisted schools will receive a Certificate from the award. The following lists are 90 entries schools in Brunei Darussalam, Cambodia, Indonesia, Lao PDR, Malaysia, Myanmar, Philippines, Singapore, Thailand and Vietnam. 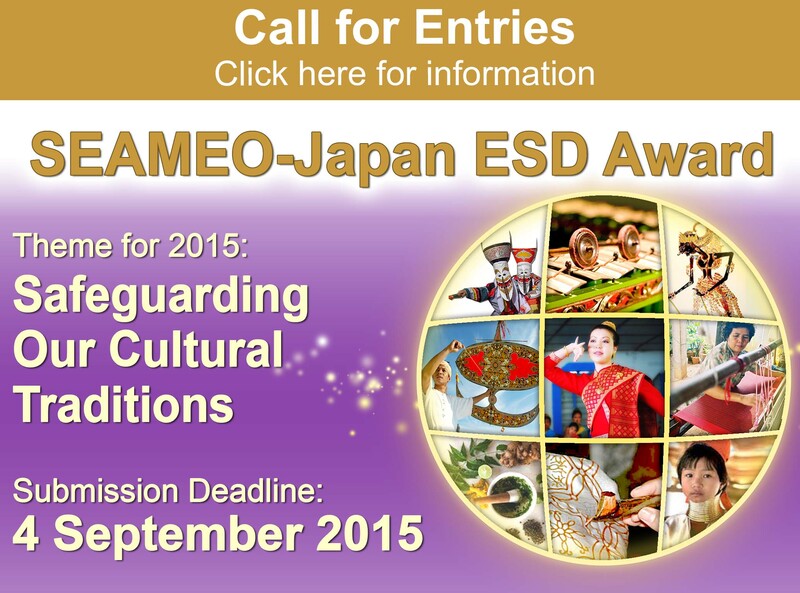 The organisers and the Judging Committee would like to express appreciation for the participation in this 2015 SEAMEO-Japan ESD Award under the theme of “Safeguarding Our Cultural Traditions”. In November 2014, within the final year of the United Nations Decade of Education for Sustainable Development (2005-2014), Japan and UNESCO co-organized the UNESCO World Conference on ESD. Through the UNESCO World Conference on ESD, many countries voiced support for the importance ESD plays in improving and ensuring the quality of education and sustainable development. In addition, the Aichi-Nagoya Declaration on ESD was adopted at the World Conference in order to enable current generations to meet their needs while allowing future generations to meet their own, with a balanced and integrated approach regarding the economic, social and environment dimensions for sustainable development. Based on the Global Action Programme (GAP), which was officially launched at the UNESCO World Conference, Japan has expressed a firm recommitment to promote ESD and has called on all stakeholders to strengthen ESD even further and take action accordingly in order to implement the specific directives of GAP. The first awards scheme in 2012 was conducted under the theme of: “Education for Disaster Risk Reduction”. This initial competition attracted entries from 69 schools in Indonesia, Lao PDR, Malaysia, Myanmar, Philippines, Thailand and Vietnam. The award in 2013 was conducted under the theme of “Values Education” and attracted entries from 126 schools in eight Southeast Asian countries, namely, Brunei Darussalam, Indonesia, Lao PDR, Malaysia, Myanmar, Philippines, Thailand and Vietnam. The award in 2014, under the theme of “Fostering Global Citizenship for Sustainable Future”, involved 63 schools in nine Southeast Asian countries, namely Brunei Darussalam, Indonesia, Lao PDR, Malaysia, Myanmar, Philippines, Singapore, Thailand and Vietnam. During the ongoing era of globalization and greater ASEAN Integration, it is important that students are aware of the decisive role they can play as responsible citizens. A distinctive feature of Southeast Asia is the region’s rich and varied cultural diversity. Sustainable development practices can help us to safeguard this cultural heritage – and Southeast Asian students can play a vitally important role in this process by understanding and sharing knowledge about the different cultures that exist within countries in the Southeast Asia region. It is also crucial that students are able to reconnect with their own local roots and value their respective cultural heritage and local knowledge so that they can safeguard it for future generations. Factors such as industrialization, globalization and social transformation pose a serious threat to our unique and diversified Southeast Asian cultures. 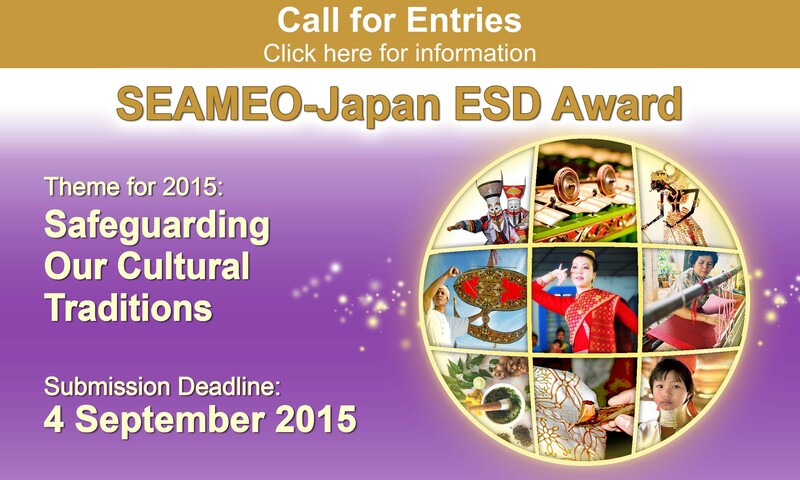 Therefore, in order to protect and foster these rich traditions and customs and preserve them for posterity, the SEAMEO-Japan ESD Award has selected “Safeguarding Our Cultural Traditions” as the theme for the competition in 2015. “Safeguarding” means making sure that culture remains an active part of life for today’s generations so that they can hand it on to the next generation. Safeguarding measures aim at ensuring an individual culture’s visibility, continuous recreation and its transmission1. “Tradition” refers to a belief or behaviour passed down within a group or society with a symbolic meaning or special significance that has origins in the past2. “Cultural Traditions” referred to in this award can be defined in a similar way to “Intangible Cultural Heritage” which refers to practices, representations, expressions, knowledge and skills handed down from generation to generation, which have provided communities with a sense of identity3. Social practices, rituals and festive events. Knowledge and practices concerning nature and the universe. To raise awareness of the cultural traditions integrated in education for the promotion of sustainable development in schools and communities in Southeast Asia and Japan. To promote and share initiatives and good practices that support sustainable development through the integration of cultural traditions into teaching and learning practices and school programmes. The entry should be relevant to the theme and the scope of “Cultural Traditions” as defined above. The entry should demonstrate how the school’s programme can promote cultural understanding and responsibility among teachers, students, parents and communities. The entry should also identify how values of cultural traditions can create a more sustainable society. The entry should demonstrate the continuous transfer of local cultural traditions such as knowledge, skills and values embedded in cultural traditions from one generation to the next so as to help keep the practices alive and relevant to the communities or groups that practice them. 3. “Learning with Intangible Heritage for a Sustainable Future, Guidelines for Educators in Asia-Pacific Region”, UNESCO Bangkok, 2015. All public and private kindergarten/elementary/secondary schools in 11 Southeast Asian countries – namely Brunei Darussalam, Cambodia, Indonesia, Lao PDR, Malaysia, Myanmar, Philippines, Singapore, Thailand, Timor-Leste and Vietnam – are invited to submit information about programmes, projects and activities that are related to the theme of this year’s competition. A study tour to Japan for four days (The organizer will sponsor the travel expenses for four to six persons, which includes round-trip airfares, accommodation for three nights, domestic transportation in Japan, interpreter, and visa fees). A representative of the winning schools will be sponsored to participate at the award’s presentation ceremony which will be held at the SEAMEO High Officials’ Meeting in November 2015 in Thailand. All participating schools that have submitted entries relevant to the theme will be recognized (name, project name and country) on the SEAMEO website and the winning schools’ details will also be posted on the SEAMEO website. Conservation and promotion of cultural traditions is emphasized and incorporated into school policies, management plans, and teaching and learning programmes within the school. The school has ensured the continuous transfer of cultural traditions from one generation to the next of knowledge, skills and values embedded in cultural traditions, so as to help keep a practice alive and relevant to the communities or groups who practice it. Monitoring and evaluation mechanisms or processes are identified to safeguard the immediate and long-term outcomes of the programme. The school’s programme has demonstrated innovative practices in safeguarding local cultural traditions. The school has demonstrated effective teaching and learning approaches that have been applied to the preservation and safeguarding of cultural traditions. The school has embedded knowledge about cultural traditions into subject disciplines and incorporated ESD principles and pedagogical methods to ensure that students are able to connect the practices in their community, in their local environment, materials and resources, and learn more effectively. Teacher capacity building programmes have been conducted to ensure that teachers are able to integrate values, skills and knowledge of cultural traditions and ESD into their lesson plans, and use appropriate teaching and learning methods and classroom-community links. The school has engaged multi-sectoral partners such as education institutions, teacher-training institutions, schools, cultural institutions and professional associations to co-implement the school’s programme. The school has engaged community-level partners such as community stakeholders, experts, cultural bearers, elders, local leaders, practitioners and parents who provide information and guidance on local cultural traditions. The school’s programme has strengthened student involvement in the local community. The school has integrated cultural tradition practices within the school management plan and teaching and learning activities across subjects for a long-term action strategy. Results, during/after implementation, have revealed the effectiveness and benefits of the school’s programme to students, teachers, parents and the wider community. Information collected about cultural traditions has been effectively compiled, documented, and shared within the schools, between schools in one area, and at the broader provincial or national levels. Schools can submit information about the school’s programme/project/activity related to the theme “Safeguarding our Cultural Traditions” between 1 June to 4 September 2015. 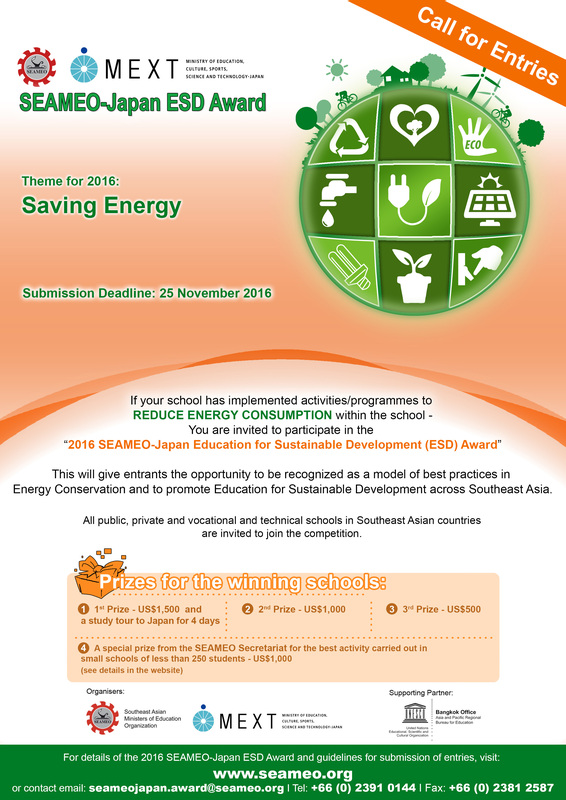 The submission of the school’s programme must be done through the template “Submission Form of 2015 SEAMEO-Japan ESD Award”. If you are not able to download the form, please request by sending an email to seameojapan.award@seameo.org. List of supporting documents such as a copy of the school operational plan, action plan, learning/teaching materials, lesson plans, samples of student worksheet, manuals, etc. Information about the school project and the photo captions must be in English. The teaching and learning materials can be in local languages, however a brief translation in English should be provided. 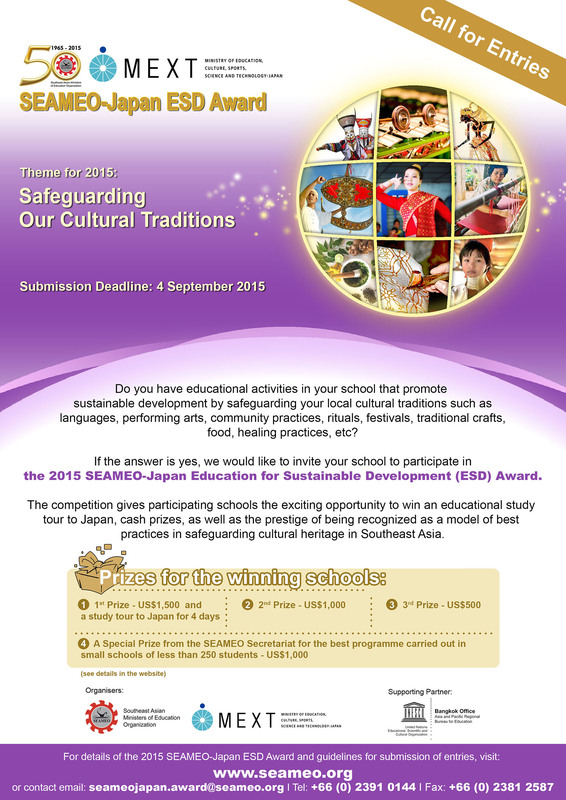 4 September 2015 Period for submission of entries to the SEAMEO Secretariat by schools.